Pine has a long history of use as a pain reliever in arthritis, aches, pains and sore muscles. Pine needle oil is used as a component in cough and cold medicines, vaporizer fluids, nasal decongestants, and analgesic ointments. Pine is combined with eucalyptus and peppermint oils for acute cold and nasal inflammation in Germany.1 In Switzerland, mattresses are filled with pine needles for treating rheumatic ailments such as arthritis and gout. When added to massage oils or used in baths pine oil is very effective in treating pain and promotes circulation to swollen joints and limbs. Preparation Methods & Dosage :Most often used as an essential oil, pine is used in aroma lamps to clear congestion and disinfect the air and surfaces. Pine oil is also used, well diluted, in massage oil blends. 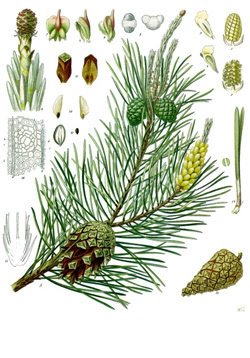 Pine oil is distilled from the twigs and needles of the Scotch pine that grows throughout much of Europe and Asia. It has a fresh, resinous, camphor-like aroma. 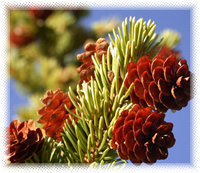 Pine Side Effects: Pine oil should always be well diluted as it can be irritating to sensitive skin. Beware of adulteration's. Scotch pine is one of the most popular choices for Christmas trees. The invigorating pine scent the pervades the home when the tree is brought indoors is perhaps the signature aroma of the holiday season, a tradition that predates Christmas. Wreaths and pine cone displays can take the place of a bulky tree if you like, and a few drops essential oil of pine can freshen the scent.